Spicy Eggplant Stew with Potatoes, Mushrooms and Chickpeas was the first recipe I made back when I decided to eat less processed foods. This was some time at the beginning of 2000. It was a new century and I wanted to start off on a healthy note. I had just quit smoking, and it was such a rush I was eager for more things to give up. White flour, white sugar, white bread, white rice - my main rule of thumb, which actually came from my brother, was that I couldn't eat anything white. I have always been interested in vegetarian fare, starting with my brief fling in my high school days when my sister convinced me it would be a good idea. That lasted six months. The next time, I think I lasted almost a year. After that, I decided maybe it would be all right if I just cut back on my meat consumption, since I seemed unable to give it up completely. One of the cookbooks I received at the time was Madhur Jaffrey's World Vegetarian. It had just come out in hardcover and I was looking for it, hoping to find a recipe or two that was not too intimidating. 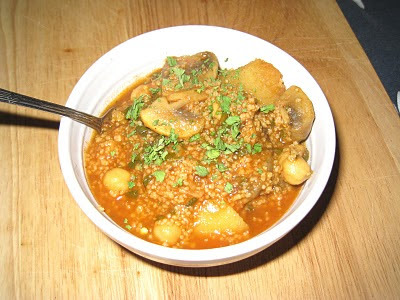 I don't know why I opted for the Spicy Eggplant Stew with Potatoes, Mushrooms and Chickpeas. Maybe I had an eggplant in the refrigerator. Maybe the ingredients were familiar enough, at least most of them. Well, except maybe for the asafetida. I didn't have that. I'd never even heard of it. And when I looked it up, I figured it wasn't anything I ever needed to get. I figured they didn't call it Devil's dung and stinking gum for nothing. But I also read that it replaces onions and garlic, so I figured I could just stick with the garlic and not worry about the stinkweed. I also didn't have cumin seeds the first time I made it, so I used ground. Not having anything against which to compare, I was pleased with the results. It went well with whole wheat couscous. As it became a dish I made with some regularity, I started thinking about the cumin and the asafetida. I picked up the cumin seeds on my next trip to the Spice House, but when I asked about asafetida, they said they didn't currently have it but might get some in in the next month or so. I didn't expect that they really would get it in, but the next time I was there and asked, they had it. It came in a small plastic jar in a plastic bag, and even before I opened it I could smell it. I can't even begin to describe the way it smells, but Devil's dung and Stinking gum are, indeed, apt names. But I have to admit, it made a difference in the Spicy Eggplant Stew. The unpleasant odor mellows in the heat, and the spice adds a warm, mellow flavor that is hard to define, but having tasted it once, I know when it is missing. I have since had occasion to use it in other Indian dishes I have made, and while I would not want to use it every day, there are times when it is a necessary component to a dish, and nothing else will do. In between those times, however, I keep the little plastic jar in a plastic bag in yet another jar, and store the whole thing on the top shelf of my spice cabinet, as far away as possible. If you're feeling adventurous, pick up some asafetida and follow the recipe. If not, just chop up some garlic and use that instead. Either way, you can't go wrong with Spicy Eggplant Stew. It's smoky, spicy, and travels well for work lunches. Or add a salad and a nice, crusty loaf of bread and you have the makings of a mighty fine dinner. I was talking to my sister while I was making this, and I mentioned my mise en place. "Take a picture of that for me," she told me. So I did. And here it is. Minus the oil (I used ghee) and the chickpeas, which I almost forgot about entirely. Anyhoo, I have gotten in the habit of setting all of my ingredients out when there are a lot of them that need to be added in a certain order. It takes a little longer, but it does make the process easier. Put the oil in a large, wide pot and set over high heat. When hot, add asafetida and cumin. Let them sizzle for 10 seconds. Add the red chiles. As soon as they swell and darken (a matter of seconds), add the garlic and the potatoes. Stir and fry for a minute. Add the eggplant chunks. Stir and fry 2 minutes. 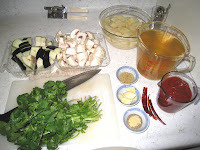 Add the mushrooms, and stir and fry another 2 minutes. Add the turmeric and ground coriander. Stir once, and then add the tomato puree, 4 cups of water, salt, cilantro, and chickpeas. Bring to a boil. Cover, turn the heat down to low, and simmer gently for 35-40 minutes, until all of the vegetables are tender. Serve over brown rice or whole wheat couscous. adapted from Madhur Jaffrey's World Vegetarian (Clarkson Potter, 1999). Enjoying your blog (just stumbled onto it today), but I couldn't disagree more about the smell of asafoetida. At my house we all love the smell. Maybe it's the brand your buying? Asafoetida clumps terribley by itself so it's always cut with some manner of gum or flour. I used to use the little white plastic bottles from the Indian store but then I discovered that Frontier Herbs sells it cut with a little rice flour. I think it's fabulous smelling and very delicious. It must be the brand I'm buying, because it has a strong sulfurous, skunky smell that permeates through the plastic bottle (yes, that's what I have) in the plastic bag in the jar in which I keep it! But it does make enough of a difference in the finished product that I still use it. I have even started using it outside of recipes that specifically call for it. Thanks for the tip on the rice flour-cut version. I will check out Frontier Herbs the next time I need to buy more. And thanks for stopping by! I'm glad you're enjoying my blog.